This afternoon as I was leaving work, I decided to stop in at McDonald’s to get a free McCafe (Thank you, McDonald’s for celebrating Teacher Appreciation Week with free drinks!) As I entered the restroom, I was shocked to see something on the floor. 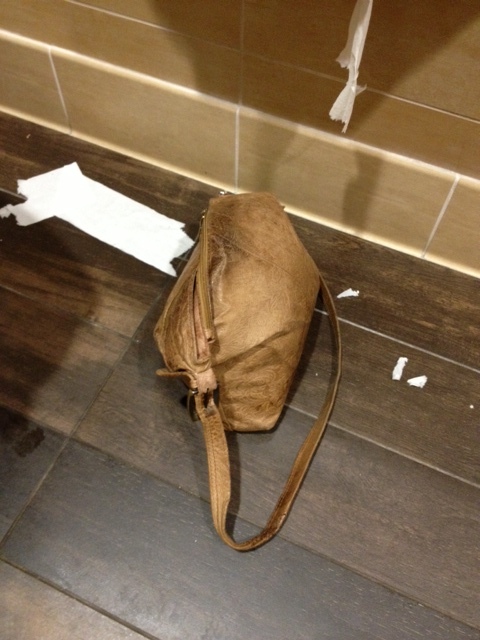 Someone had left their purse! Oh my goodness! I looked around the restroom and, of course, I was alone. Without a moment’s hesitation, I grabbed the purse and walked towards the door, ready to take the purse to the manager of the restaurant. As I pushed open the door, I was met by a frantic woman who exclaimed, “Oh thank you! That’s my purse!” You could see the panic in her eyes which was immediately brightened by relief as I handed her the purse. The entire event lasted less than two minutes. But, oh, how important those two minutes were! It’s funny how some acts of kindness are truly random. I like to think of them as “perfectly timed randomness”. It never occured to me to do anything with the purse other than turn it in. However, had I not been in that McDonald’s, right in that moment, this lady may not have ever seen her purse again. What treasures might she have lost? Thankfully we will never know because tonight she has her purse, safe and sound. Best of all, I have a happy heart because I did the right thing and I know it blessed someone else. Tonight’s random act of kindness is dedicated to Mary Sherlach, age 56, who was the Sandy Hook school psychologist. As a veteran educator, one year away from retirement, I’m sure she had counseled many children under her charge to “do the right thing”. Maybe a small part of her can live on when others “do the right thing”, too. Be blessed my friends and always keep your eyes open for opportunities to bless one another!